Last week took place the Apple WWDC, an important moment for the firm. Like every year, this is an opportunity to revisit the latest market trends and uncover some new things to developers and media in the room. 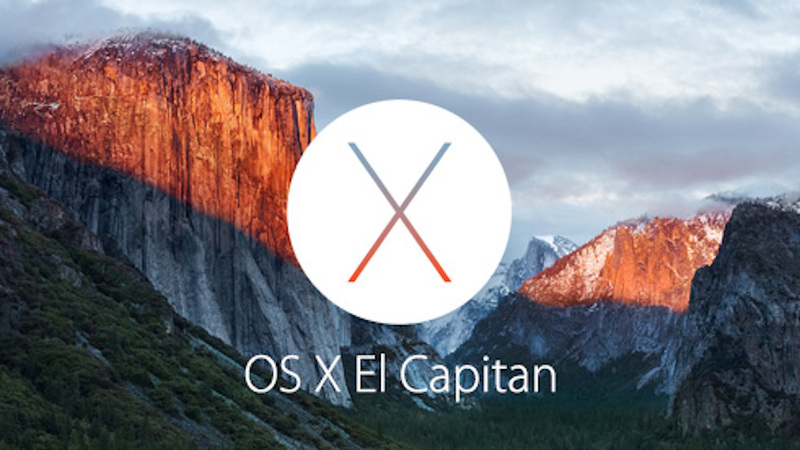 Sucessor of Yosemite, El Capitan is the 10.11 version of the OS dedicated to Macs. Its name comes from a rock formation located in the heart of... Yosemite Valley. This is an update improving OS X on three main points. Surely inspired by what is already on Windows 8, Apple took over this function by expanding it. Now you can arrange two windows side by side, resize them, put them in full screen directly from the Mission Control ... Many news coming from that side. The search function dedicated to Macs also has several new features and becomes smarter. If you request information in your own words in the form of a sentence ("Show me the pictures of July") Spotlight will search it for you. It’s the same things for the mails ("John mails I've never read), documents and many other things to come. Apps installed by default by Apple are also entitled to their share of novelties. 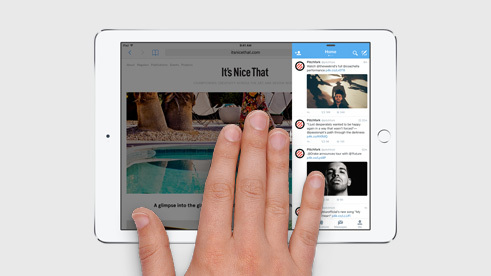 Safari allows you to see more easily from which tab the music comes and Mail incorporate trackpad gestures. Announced last year for iOS, "Metal" now enters on Mac. Metal is a new API that allows apps to be faster and graphics of the games to be improved. As for performance, Craig Federighi promised us a much faster OS. Opening an app will be up to 1.4 times faster, the app switch will be twice as fast, and opening a PDF 4x faster. 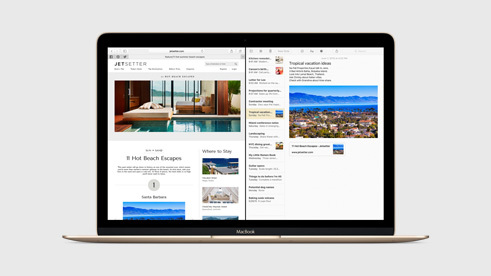 El Capitan OS X will be available this fall. Like OS X, iOS 9 is an upgrade focusing on improving the OS’ performances and stability. The search screen has been completely redesigned. It will now offer you your favorite contacts and apps you use most often. And most important, the Search API is now open to developers! So you can find search results corresponding to content that comes directly from your applications. The Notes and Maps applications have also been reworked. For the first, public transportation was added and for the second, it is now possible to make lists or integrate directly links and photos. But the updated iOS brings more to the iPad than to the iPhone. The iPad now includes split-screen ( possibility to put two applications side by side and use them simultaneously ) and even the "picture in picture video". Understand that you can now watch a video over another application. The iPad's keyboard had changed and now incorporates gestures on the trackpad as the Mac, in addition to new shortcuts. Apple pay can now be integrated directly into the apps for you to pay much more easily. 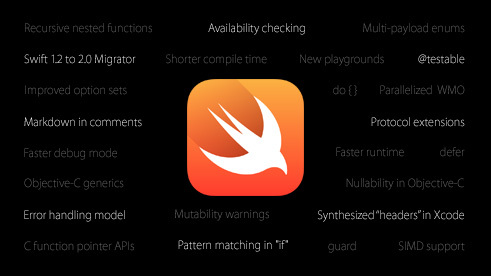 On the programming side, Swift, the new programming language announced by Apple last year is now in version 2. Simpler and more secure than Objective-C, it will go open source by the end of the year. iOS 9 will be available this fall on the same devices than iOS 8. 6 weeks after the launch of the watch, watchOS is already in version 2. This new version allows you, among other things, to change the wallpaper of the watch with your photos, "time travel" by showing you what the weather was 30 minutes ago or what the weather will be in 30 minutes, and pass audio FaceTime calls. Apple also thought about developers: they finally can create native applications for the Apple Watch (something hitherto impossible), and "complications", custom screens to deliver more informations (score of a match, news ... ). 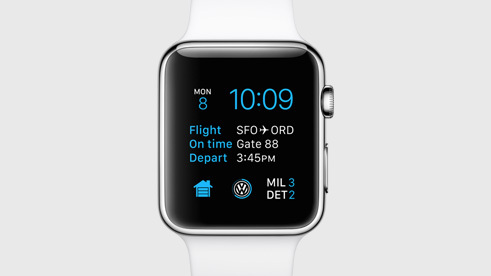 watchOS 2 will be available this fall. Direct competitor of Spotify, Apple launches its music streaming service. Simply called Apple Music and introduced by rapper Drake, it will be available at the end of June and will cost 9.90$ per month. The innovations presented by Apple at the conference will be included in a future release of TapPublisher, this is why we pay a special attention to this event.